So this is my mom's recipe. I've made other recipes, but still always come back to this one. Maybe that's because it's the one that tastes how I remember shortbread. The official recipe is for double this amount, but I like doing just a half recipe, and even then I always freeze some. It's rich stuff. Stir in the flour. 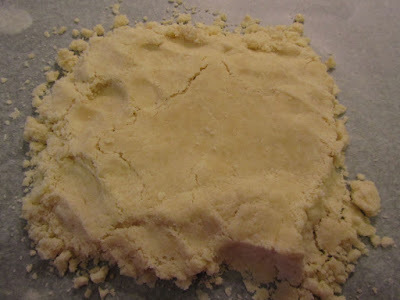 It will look kind of crumbly, like this. Use your hands to form the dough into a ball, as well as you can. The warmth of your hands will further soften the butter helping it to hold together, somewhat. Put this dough and extra crumbs onto a sheet of waxed paper or parchment, and press it into a block, about 3/4 inch thick, like this. If the dough is just too crumbly and dry, you can microwave all of it in the bowl for about 8 seconds, then try and press together. Keep working it, until it looks more like this. 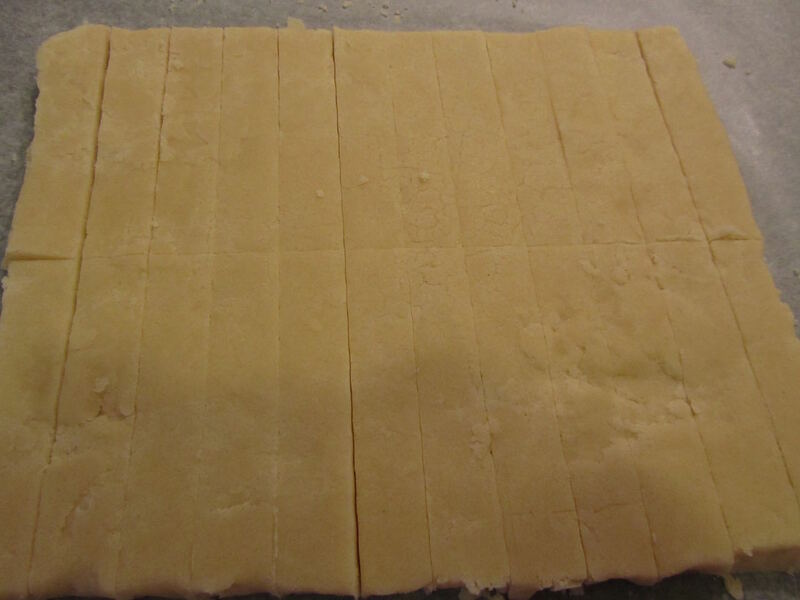 Place a second sheet of waxed paper over the rectangle, and use a rolling pin to very gently roll the dough to about 1/4-inch thick. If it cracks, just press it back together. Cut off uneven corners and edges, and with your fingers, press these scraps into areas needing more dough. 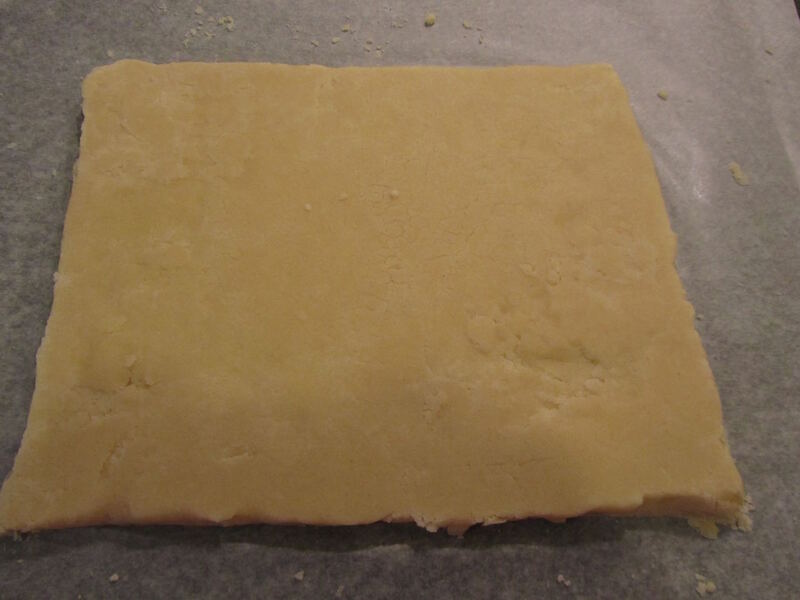 Continue pressing the dough into a rectangle, about 6 inches by 9 inches, with straight edges. 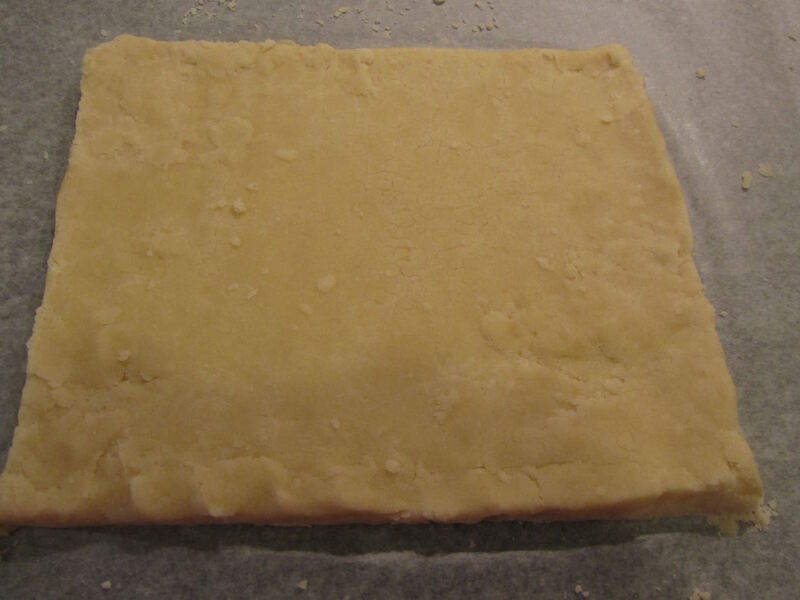 (I use a table knife to help get the edges straight, by pressing the edge of the knife against the sides of the dough.) The warmth of your hands will help in forming the dough. Roll over lightly with waxed paper and rolling pin one more time, to smooth the top. Doesn't have to be perfect as it will even out in baking. 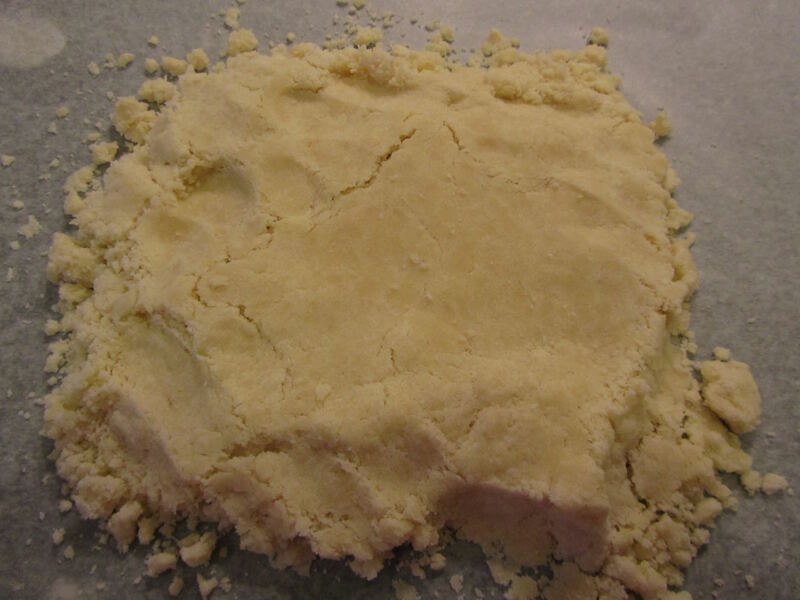 If dough breaks at any point, just press it back together with your fingers. 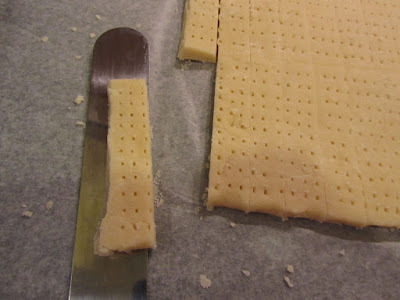 With a long knife (like a bread knife), cut the dough into 24 pieces. The reason you use a long knife is you want to press the knife down into the dough, not draw it through the dough (keeps the pieces neater-looking, this way). Prick the top surface, lightly, with a fork. 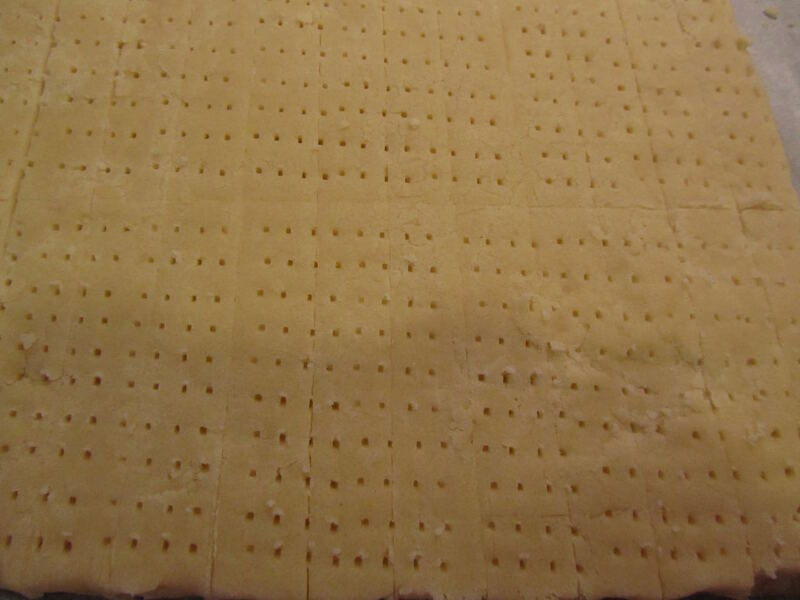 After the dough has been cut and pricked, use a thin, metal spatula (like an offset spatula if you have one) to transfer to an un-greased baking sheet, keeping shortbread pieces about 1/2 inch apart. Sometimes my dough is just a tad too crumbly and a piece breaks while transferring it to the sheet. I just press it back together, as best as possible. Bake in a preheated 300 degree F non-convection oven for 20 to 30 minutes, in the center of oven. 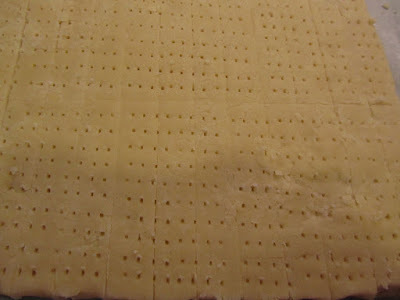 You don't want the shortbread to brown, but want it to look dry on the surface. Begin checking at 20 minutes, then every 3 to 5 minutes from there. this batch baked for 25 minutes. When the end piece is just beginning to show some caramelization, they're done. 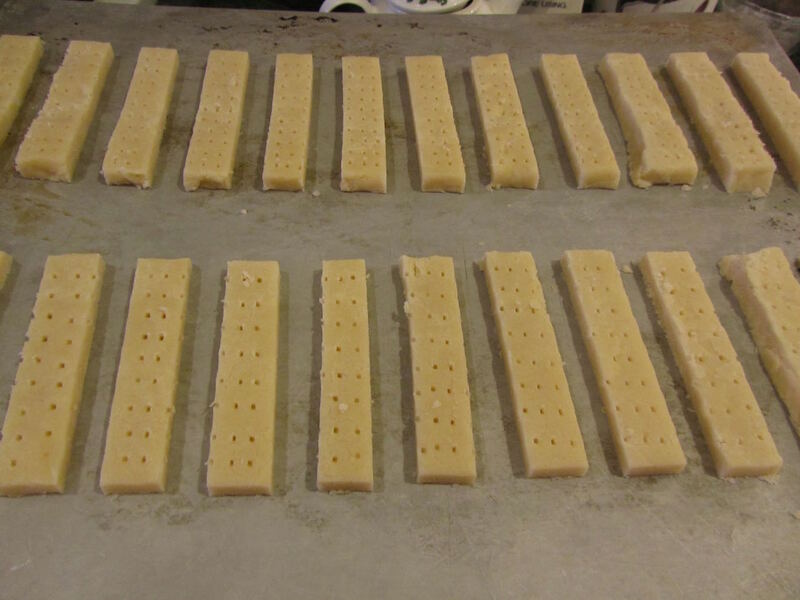 Allow to cool on the baking sheet for 5 minutes, then transfer to a wire rack. My apologies that it took me all week to get this posted. 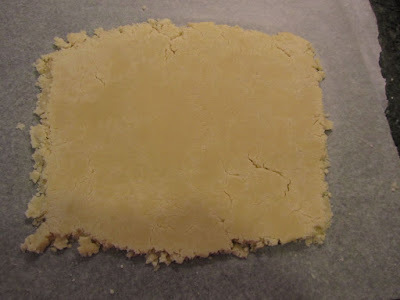 I wanted to do more than just type the recipe, but wanted to show pictures of what it will look like at each stage in making the dough, so you wouldn't freak when your dough was more crumbly than any other cookie dough that you've made. And yesterday afternoon was the first chance I had to do some baking. I sure wish I could send some of this to you! Sharing the recipe is the next best thing, though, don't you think? Anyways, enjoy, if you make it! Yum! 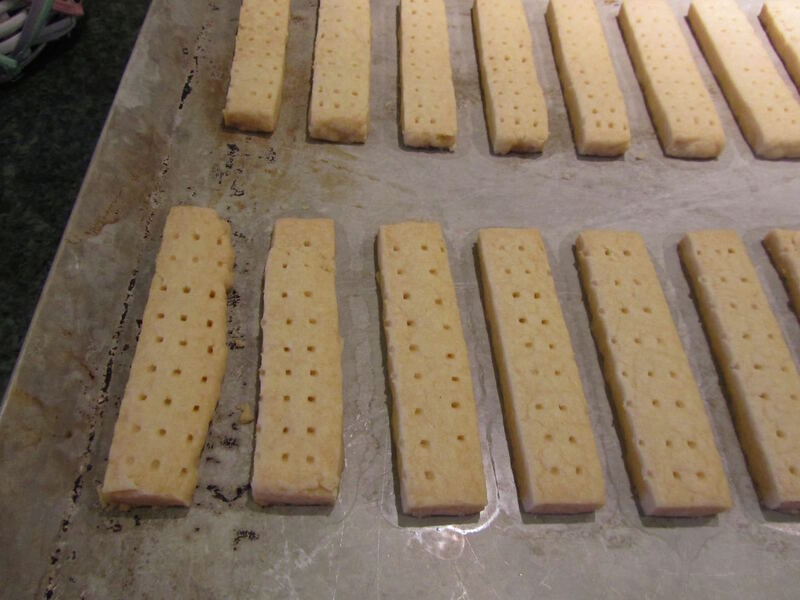 I love shortbread. Thank you for sharing the recipe. Yes, it is the next best thing. I love it, too! You're welcome. I'm making rhubarb pie right now ... it's our wedding anniversary today and I couldn't think of anything else to do for my husband. Pie will make him happy. Happy Anniversary to you and your husband, Kris! And, yes, what a nice thing to do for your husband. Tomorrow is my husband's birthday, so I'll be making a pie for that! Are you doing a double crust or crumb crust or single crust on your pie? Double crust. I used frozen rhubarb so I added a bit more flour the the rhubarb mixture, as I find the frozen tends to have more moisture than the fresh. Hope it tastes good--I'm pleased with how it looks. Will you post your hubby's birthday pie? Oh yum! It will be great, I'm sure! And good thinking to add more flour. That's the one thing I usually miss on with fruit pies. Mine often turn out on the runny side. Have a wonderful anniversary, you two! Baking the birthday pie, right now! How did your anniversary pie turn out? Thanks for the great instructions, Lili. 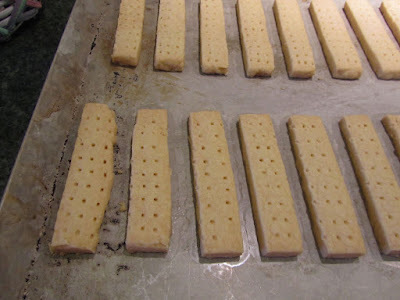 I haven't made shortbread in rectangles, just as cutout cookies. I will try this version next time. Yum! You're welcome. I've only made the "fingers" and "petticoat tails", and never cut-outs. Is it salted or unsalted butter? I am going to try this since I want just something plain for a change. I use salted butter, as I like the flavor. But I do think you could go either way. If your baking tends to be lower in sodium, then unsalted might suit your taste better. But if you always do the full salt in baking, then salted butter would probably suit you better. One of the things I love about this recipe is they are so low in sugar, 1/2 teaspoon per cookie. Sometimes I just want a cookie that's not so sweet. Enjoy! Last week you mentioned that this was a crunchier version and to make it softer to add something, but I can't remember what. I tend to like my cookies softer and usually cut back on the butter to do that. Not sure if that would work for shortbread. 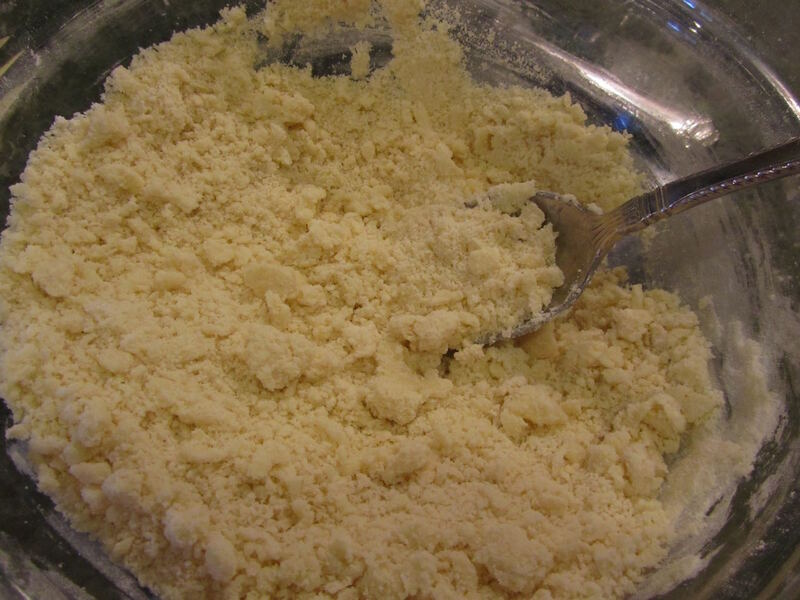 I don't know if this helps with a shortbread cookie, but I've had good luck with adding 2 teaspoons of cornstarch to my drop cookies (chocolate chip, etc.) to make them softer. It's a trick I learned at Averiecooks.com. 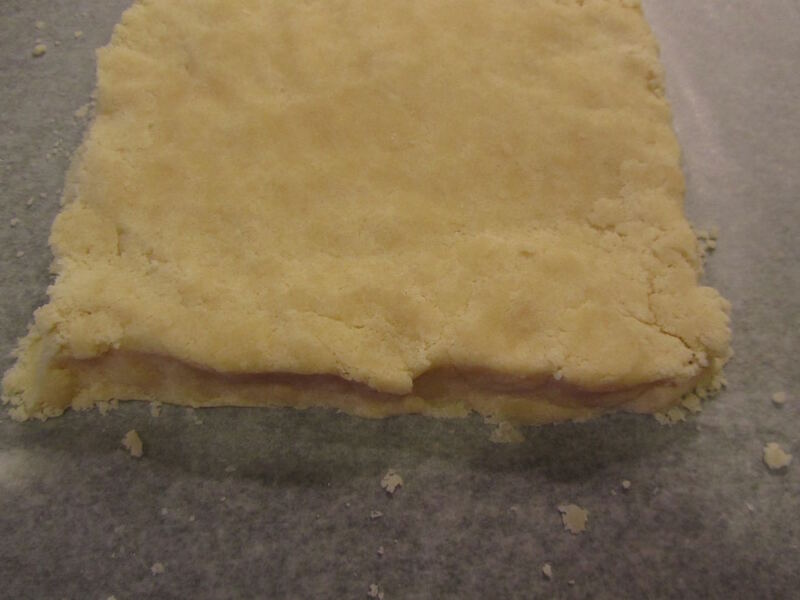 Yes the shortbread that's on the more tender side usually has cornstarch in place of some of the flour. It still has about the same amount of butter, but one way to make shortbread "lighter" is to simply make the pieces smaller. That's my "fix" for the high butter content, at least. Thanks. I'll try the cornstarch fix. Enjoy them! And please let me know how the recipe works for you. Thank You Lili, I am not much of a baker but I will be trying these! I hope your husband is having a great birthday. I think we made him feel special fro his birthday! Thanks for the good wishes. Have a great weekend, Rhonda! Shortbread cookies are my favorite! Thanks so much for posting your recipe and taking the time to do the photos. I am pretty sure I would have felt like I messed something up with the crumbliness! I love your blog. and that's why I wanted to post photos, too, because this dough is so crumbly at first, that even after making it many, many times, I find myself thinking maybe I should add water. But the instructions I have say adding water will toughen the cookies. Enjoy them if you make the recipe! Have a great weekend!